Sports Authority is an industry leader in all things sports. Online and in stores, Sports Authority specializes in sporting goods equipment and accessories, as well as fitness and clothing products. Sports Authority is a widely recognized name for providing anything that fans, athletes, and sports lovers need in relationship to sports. 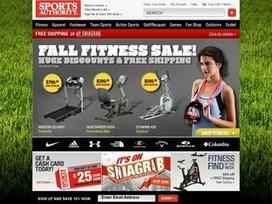 Many customers shop at Sports Authority for their selection of sporting good equipment. With an array of products across virtually every sport imaginable, it is easy to see why Sports Authority is a one-stop shop in this area. Athletes, coaches and parents will be pleased with the variety available. Regulation baseball bats, basketballs, and footballs, for instance, will fit in very well with many young budding athletes. Sports Authority is the perfect place to shop for Little League, high school or college sports equipment. However, Sports Authority is not just for popular team sports. Field hockey, figure skating, bowling, rugby, and cricket products represent some lesser-known sports that the store caters to, across the country and online. Action and extreme sports lovers can feel at home with their selection of mountain bikes, skates, skiing, and skateboarding products, for instance. If there is a club or a racquet involved, you can find it at Sports Authority as well. Clubs, racquets, and balls are available for golf, tennis, racquetball, squash, and badminton. From these and other categories (such as outdoors, fitness equipment, and even indoor games, for instance), Sports Authority has an impressive selection of items. Of course, there is much more. If actual sporting goods products and complementary accessories are one category, then there is another major area that Sports Authority caters to: clothing. Whether it is or isn't necessarily for a sport, Sports Authority has it. Sports Authority specializes in a wide range of clothing. You'll find many popular brands for pants, shorts, tops and T-shirts, sweatshirts, and outerwear available at local stores and online. Men's, women's, and children's apparel is available at Sports Authority locations. With the impressive amount of items available in stores and especially online, you might be searching for a promo code as well as your favorite brands. Footwear is yet another primary category for the Sports Authority lineup. You will find plenty of shoes that are geared towards a particular sport, such as football and baseball cleats, and basketball shoes. However, cross training, walking, and casual footwear is available for men, women and children as well. Overall, it is easy to see why Sports Authority is such a popular sporting goods retailer. With a complete selection of sporting goods, clothing, and accessories, it truly is a one-stop place for all things sports--and even that which is not sports-related. Check your closest Sports Authority location or online to see more. Share what you think about Sports Authority, and your favorite ways to save there! Best coupons and online deals!